As you walk along the 1300 block of Locust with stately institutions like the Historical Society of Pennsylvania and the Library Company, you’re likely to pass a blink-and-you’ll-miss-it National Historic Landmark dedicated to Women’s History. Were it not for a large mural depicting the progress of women and a historic marker on the sidewalk, you’d never know that this unassuming house was the locus for a wide array of political causes including women’s suffrage, municipal reform, consumer issues, labor reform, and citizenship training for women during the early decades of the 20th century. You certainly would not know that this beautiful national treasure is the home of the New Century Trust, an organization rich in history. After the success of the women’s pavilion at the 1876 Centennial Exposition held in West Fairmount Park, Eliza Sproat Turner (1826-1903), a philanthropist, author, abolitionist, and tireless crusader of women’s rights, joined forces with like-minded friends to create the New Century Club. They soon turned their focus to the welfare of working women. The New Century Guild, an offshoot of the New Century Club, founded in 1882 by Eliza Turner, was one of the earliest, largest, and most successful of the many organizations created across the country in the 19th century to provide assistance to the increasing numbers of women who were entering the labor force. In 1890, the Guild organized a trade school to train women for better paying jobs or self-employment. It offered courses in dressmaking, millinery, printing, glass making, bookkeeping, and accounting. The Guild’s programs had grown to the point that it was in need of its own building and additional funds to supplement the costs of the Guild’s activities beyond the modest membership dues. In 1893, the New Century Trust was incorporated into the Guild to finance its operations. Composed of a group of affluent philanthropic ladies, the Trust accumulated funds to purchase the Guild’s first building on Arch Street. Later, commercialization of the neighborhood, including the expansion of Reading Terminal Market, sent the Trust on a search for new real estate. The property at 1307 Locust Street was purchased in 1906. Immediately, the Trust tailored the 1850s rowhouse to meet the mission of the Guild and its membership of over 1,000 working women. Rooms on the second floor were adapted into a large auditorium to provide space for the programs and classes that were central to the Guild’s mission. A large commercial kitchen was added to the first floor’s dining space for the Guild’s most popular program, the “Noon Rest,” a nutritious, low-cost meal. This service, which provided a respectable place for unaccompanied women to socialize and find some respite during the work day, was discontinued during World War II as a result of rationing. A significant lending library was developed on the second floor, which had about 4,000 volumes by 1920. On the 3rd and 4th floor, the bedrooms were converted into boarding rooms. For 25 cents, members could stay for up to three nights a week, allowing women the opportunity to safely enjoy the city’s offerings, as well as providing a temporary emergency shelter for women in need. Today, two large cabinets, showcasing a special collection of tea cups, occupy a place of honor in the parlor. It was while drinking tea from these very cups that the women of the Guild connected over women’s issues, and worked tirelessly on behalf of the female population. Membership in the Guild created a network of like-minded women, many of whom took their first steps to fight for suffragism from the Guild building, stepping off the marble entry and making their way up Broad Street to join thousands of women fighting for the essential right to vote. Guild activities evolved and shifted over the course of its history. 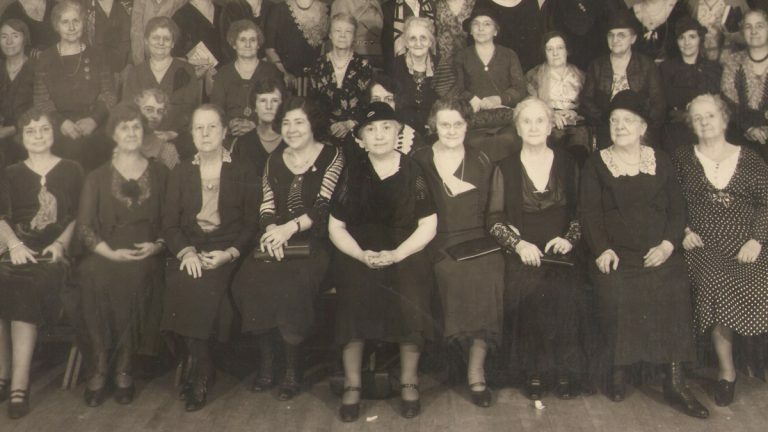 In later years, Guild members, many of whom were lifelong members, expanded the Guild’s original goal of improving the living and working conditions for all working women, to include improving the lives and work of individual members as well. Social activities were sponsored for members, including dramatic and musical entertainment, as well as lectures and discussions on a variety of topics. Dinners were offered to members in the dining room two nights a week. However, much of the Guild’s activity was service oriented and reflected linkages among hundreds of women’s organizations across the country. The Guild was formally dissolved in the early 2000s. Eliza Turner’s vision, to improve the educational, economic, and social status of women and girls, lives on through the mission of the New Century Trust today. Through the grants program, the New Century Trust provides funding to non-profit organizations serving females. The organization is engaged in on-going efforts to preserve the Guild building, which is listed on the Philadelphia and Pennsylvania Historical Registers and is a National Landmark in Women’s History on the National Register of Historic Places. The beautiful building is available for rental for meetings, film screenings, lectures and other events. Through year-long programming, the organization educates the public about women’s issues and the New Century Trust’s role in women’s history, and it is the place in Philadelphia to celebrate Women’s History Month. Meg Kelly is historic site administrator and community liaison at New Century Trust. Learn more about New Century Trust and its series of events for Women’s History Month at www.newcenturytrust.org.